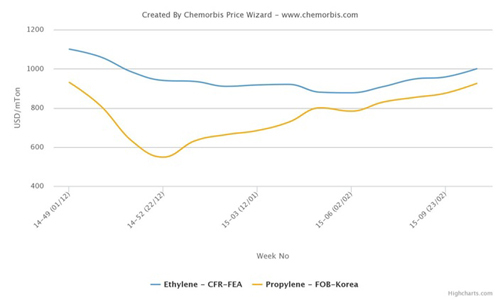 Spot prices for ethylene and propylene in Asia have risen to hit their highest levels since the start of December, according to data from ChemOrbis Price Wizard. Players attribute the rise in monomer prices to supply tightness ahead of a heavy cracker turnaround season in the region. Cracker operators in Asia are reportedly set to take over 3.7 million tons/year of ethylene capacity off-line between March and May for annual maintenance. In addition to supply tightness, several players commented that demand had also improved as derivative producers wished to secure cargoes before the upcoming cracker turnarounds. 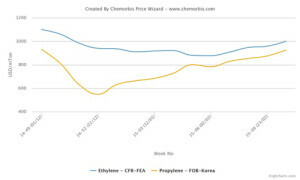 Rising prices for ethylene and propylene derivatives also encouraged monomer buyers to step up their purchasing activity. Players in Southeast Asia commented that availability within the region is particularly tight owing to reduced operating rates on the part of several regional cracker operators. After witnessing steep declines throughout the last few months of 2014, spot ethylene and propylene prices have regained some lost ground and now stand at the highest levels seen since early December, according to ChemOrbis. Spot propylene prices on an FOB South Korea basis have jumped nearly $380/ton since late December after seeing a particularly steep drop at the end of the previous year. Spot ethylene prices on a CFR NE Asia basis, meanwhile, have risen around $120/ton compared with their year-to-date low point in early February. In production news, South Korea’s LG Chemical is reportedly planning to conduct a month long shutdown at their 900,000 tons/year cracker in Daesan from March 15 to April 19. Samsung Total is also planning to conduct a 40-day maintenance at its 700,000 tons/year cracker in Daesan in April. In Japan, Maruzen Petrochemical shut its 520,000 tons/year cracker in Chiba for technical reasons earlier this week. Idemitsu Kosan will shut a 375,000 tons/year cracker for 2 months sometime between April and June while Mitsubishi Chemical will shut a 475,000 tons/year cracker in May for a turnaround and expansion project. In China, BASF-YPC will conduct a two month shutdown at its 740,000 tons/year cracker in the April-May period.